“The Orphanage” has been haunting U.S. theaters since Dec 29th. The second highest opening in Spanish film history, it is director Juan Antonio Bayona‘s first feature. Helping the film scare the living daylights out of me was sound designer Oriol Tarragó. Tarragó also designed on last year’s Spanish horror film, “REC”. Much in the same vein as last week’s “Cloverfield”, “REC” was shot exclusively in-camera and presented with little to no score, a formula revisited in the U.S. remake, “Quarantined” which will be out this fall. Mixing for “The Orphanage”, which is also set to be remade in the states(bleh), was done at Soundtrack of Barcelona with Marc Orts manning the faders. Orts, also of “REC” fame, has worked in collaboration with Tarragó since 2001. Xavier Masmanifested production sound for “The Orphanage”, while score for the film was composed by Fernando Velázquez with the Bulgarian Symphony Orchestra – SIF 309. In addition to the sound, Velázquez’s score was recognized this year for a Goya Award (the Spanish Oscars) adding to the film’s total of 14 nominations. Always on the hunt for a truly scary film, “The Orphanage” is now my prey. I haven’t been so terrified in a theater in a long time. 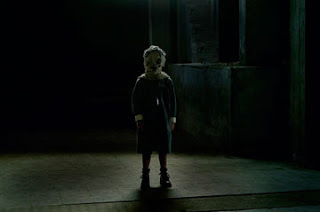 Thanks so much to sound designer Oriol Tarragó for taking the time to talk about the work he and the crew on “The Orphanage” did to scare theater-goers everywhere. DS: How did you get involved with the film? OT: Juan Antonio Bayona [director] and I have been friends since we were in college (ESCAC) and he has always counted on me to work on his projects. When he got the chance to make a feature movie he didn’t hesitate to show me the script, years before he started shooting. FSD: How long was the schedule? How early did you start? OT: I got involved in the movie from pre-production. I followed the project until the final cut. Regarding post-production and sound design specifically, I began in November 2006. The process of sound post-production lasted some 6 months. The final cut was ready in early November 2006 and we finished mixing by late April 2007. We edited dialogue for 5 weeks, getting rid of any undesirable sounds from the production which also pointed out which sounds would be needed. Then we created all the foley effects (2 weeks) and all the sound effects that would be mixed in with the dialogue. We then spent another 2 weeks recording “walla” and ADR and doing special recording sessions for sound effects. After that, we spent 2 months editing and designing the sound. Once all the sound was layered, we also spent a week editing the music by listening to the movie as a whole, just right before mixing. We had 3 weeks of pre-mix and the final mix was over one week. FSD: What specifics did you record for the film? OT: After principle photography wrapped, we spent a day on the empty set recording sounds. The house is one more character in the movie and so I needed many sounds to emphasize its personality. My family has a very old house in the mountains, which is completely isolated from civilization. I went up there one weekend. I was lucky because it wasn’t windy and it was a quiet, misty winter day, so I could record a lot of sounds both from the inside and the outside of the house using a stereo Schoeps microphone and recording on a MacBook Pro with an M-Box Pro running Pro Tools. I recorded steps from different floors, bangs on the wooden beams, doors slammed from different positions within the house, and glass windows being opened and closed. The creaks I got from the main staircase of the house were edited later into the foley footsteps to get that creaky wood floor of the house. For the séance, we did a lot of recording with different children. We used ADR actors, children actors and the children of relatives and friends. It took us a long time of recording to get the truly terrified screams. We had to play scary games to have the kids scream. We got a lot of laughter and a lot of wasteful stuff. It took us 5 days of recording, but we got enough out of those 5 days to make up the séance. One day, I locked myself in the studio to create weird sounds with my mouth, using water, which I later used to create Tomás’ breathing. I wanted to create some breathing made up by two textures, a very high-pitched, almost choking one, and another one that had a rather animal, low-pitched and threatening tone. Sergio, the screenwriter, told me that he’d had asthma as a child. I recorded his breathing and used his sounds for the inhaling and the sounds I made for the exhaling. FSD: This was director Juan Antonio Bayona’s first feature film – what original ideas did he have for how the sound would be utilized? OT: Bayona always insisted on the fact that the house should be one more character in the movie. He wanted the movie to sound “worn”, to sound like old wood. He repeated this over and over: “The house has to sound like wood”. He didn’t want the sound to be too fantastic; on the contrary, he wanted every sound to have a plausible “real world” source, to delve into the dichotomy of ghosts versus non-ghosts. He always asked for frightening sound elements to be real. FSD: Was Guillermo Del Toro involved in any sound related concepts or decisions? OT: I met Guillermo del Toro when I worked for him as a sound editor in “The Devil’s Backbone”. He gets very involved in the process of making the sound. This time he totally trusted Juan Antonio Bayona and me for the sound and did not interfere at all in the process. However, when we first saw the movie at the Cannes Film Festival 2007, Guillermo, J.A. and I agreed that some things needed to be changed; thanks to Guillermo, we had the chance to re-mix some scenes. It’s great that Guillermo del Toro is so aware of the importance of sound and we were lucky that he gave us this chance to go back to the mixing. FSD: During the séance scene in the film a lot of the action takes place through video monitors and off-screen (obviously only conveyed with sound). How did you approach that scene? Was it always intended to be such a sound heavy scene? OT: This was the most difficult scene in terms of sound design. Ever since I read the script, it was always a challenge for me. Why was it a challenge? Because I needed to figure it out how to make the sound design of a parapsychologist séance, yet keep the realistic tone of the movie. We had to maintain the realistic tone and hear ghosts at the same time. It was kind of contradictory and therefore very difficult. The visual approach for the séance helped me deal with the design. I decided that all paranormal sounds would be always heard through the old devices that we saw in the movie. The vintage look of these devices helped me to find the old and realistic sound for the psychophony. I then understood that the whole séance and everything we’d heard should be mono and would only be on the central channel, instead of trying to create a fantastic sound design that would not be consistent with the tone of the movie. Before we even began the sound design, we intended the sound to be terrifying, horrific and irritating. DS: Moans and creaks throughout the house leave the audience ill at ease. What motivated the placement of these sounds? How do they evolve over the course of the story? OT: This is because we wanted to give the house a personality. Make it a character, from the beginning. Early into the movie, these creaks and moans are justified realistically; however, when Laura has lost her son, she enters a desperate search for him. The sound of the movie becomes somewhat subjective and her six senses are tuned on to trying to find her son. Exaggerating these little creaks and moans of the house emphasizes the feeling of paranoia that Laura has in trying to find any clue as to where her son is. In the end, the sounds appear to be increasingly related to the ghosts or dwellers of the house. FSD: The ghosts affect a lot of real world objects in the film. Was there any emphasis on the sound a prop made when manipulated by the dead as opposed to that of the living? OT: There are few times when ghosts touch real world objects. There was no intention to create different sounds for these movements. However, we always intended the movie to have marked sound dynamics. So, when these sounds do appear, we are usually in silence and there is a very strong leap in the volume, which exaggerates these actions. FSD: Silence is mentioned a lot when discussing sound. What was your approach in this device’s usage? OT: Silence is a very important element in this film. I tried to build the sound design toward silence; I tried to build downwards, from harder to softer. Thus, at the beginning of the movie, the house and the ambiences are very rich in terms of sound, even cheerful. However, when Simón goes missing and as Laura gets lonelier, the house becomes more and more silent, just like the character of Laura. Total silence represents Laura’s loneliness and desperateness in the world and her realization that her dreams have been destroyed. Then, toward the end, when Laura finds Simón, the movie bursts into sound again to emphasize this idea.